Millbrook Press, Minneapolis, 2017. 40 pages. The Search for Olinguito is a fascinating story, telling about how scientist Kristofer Helgen suspected and then confirmed that there was a new species in the raccoon family. Kristofer was studying another mammal, the olingo. He worked for the Smithsonian National Museum of Natural History. In 2002, he was looking at samples of pelts and skulls from olingos in different regions – and found one completely different from the others. This animal had a different shade of fur, a different skull shape, and larger, pointier teeth. He went looking in other museums and found five similar samples. But then the question arose: Do olinguitos still exist? Could researchers find them in the wild? The search led first to a zoo. In the 1960s, the Louisville Zoo had tried to start a breeding program with olingos. But the female olingo, Ringerl, that they brought in would never choose a mate. They sent this supposed olingo to various zoos, but she never did produce any babies. 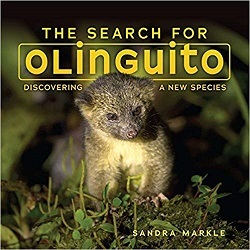 Kristofer checked her DNA from a sample in the National Institutes of Health database, and she was indeed an olinguito. So – they decided to search in the habitat where Ringerl was originally found, the cloud forest. That put them on track to finally discover olinguitos in the wild. When they tried to publish a paper about the new species in a journal in 2006, they were told they still needed more information about its physical traits and behavior. So from 2006 to 2011, scientists gathered more data. A report was finally published in the journal ZooKeys on August 15, 2013. That day Kristofer also officially announced the olinguito to the world at a press conference. I like the way this shows a true and recent story of a scientist at work. There are cute animal pictures, too! This entry was posted on Wednesday, October 24th, 2018 at 10:33 pm and is filed under Children's Nonfiction Review, Science. You can follow any responses to this entry through the RSS 2.0 feed. You can leave a response, or trackback from your own site.